A Sharp End to a Great Season! LAST LAP, LAST CORNER, AND STILL AN OPEN RACE! 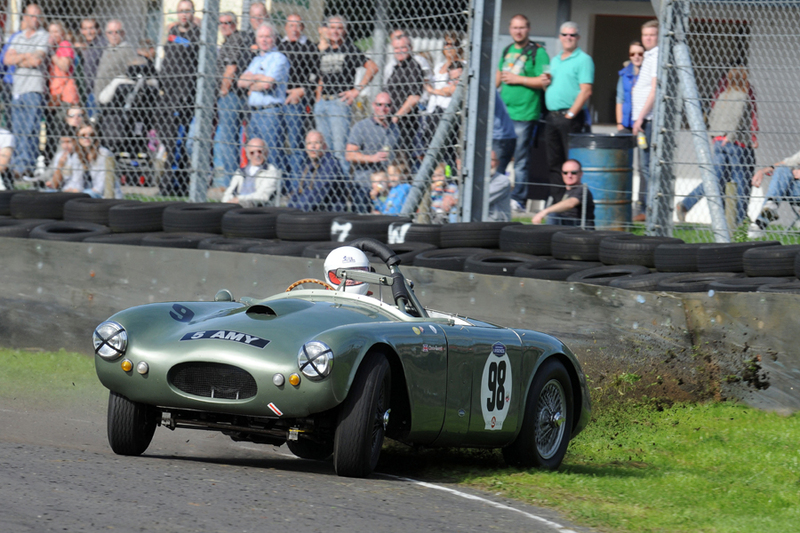 The second Castle Combe Historic Festival was to be the final round of the Fiscar series once again. Last year was the first time this event ran, and it was blessed with beautiful autumn weather and great racing. Who would have thought CC could repeat that and even better it? The format was similar in that many entrants in the FISCAR car race were also taking part in the separate Aston Martin, Austin Healey and Jaguar marque races, but FISCAR had both the 50’s sportscars and also a new separate race for the ‘FLIERS’, for the smaller sports racers which has its own report. 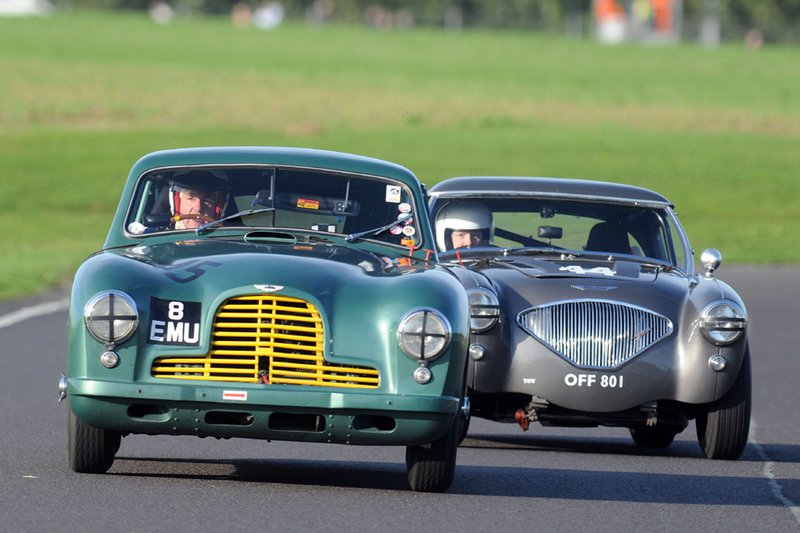 The popularity of this race was demonstrated by the strong showing of 33 entrants and although attrition from both testing and the earlier Aston Martin race reduced the line up, it was still our best grid of the year. In addition to a strong showing from the series regulars, we were blessed with some newcomers, who were most welcome and we hope to see them out again next year. It was indeed a pleasure to see series sponsor and provider of the popular FISCAR hospitality, Paul Woolmer of Woolmer Classics, taking part in the race with David Large in the latter’s Healey 100S. We had two Healey teams out this time, with newcomer Robert Clarke in the 100 ‘coming out’ as a convert from his Feltham Aston. A youngster to watch was a certain Barrie Williams who pimped a ride in Nick Wilkins’ XK120, the joint age of these two spritely lads was probably unbeatable down the grid! It was also the first time that we had two Frazer Nashes on the grid and we can but hope to see them out with us again. In summary, the crowd who always turn out in big numbers at Combe, were in for a real treat, and believe me they were not to be disappointed either in the line-up of beautiful cars, or the quality of racing, so read on. As the 5th race in the programme, qualifying was a civilised mid-morning session that showed a familiar face at the front. Brian Arculus put the Lotus Elite on pole, but not by much, 0.033s to be precise, ahead of Mike Thorne and Johnny Todd in the Healey 100 and 0.19s ahead of the Hunt / Blakeney Edwards Fraser Nash. 3 cars within 0.2s at the front, the day was shaping up nicely…. Other familiar names filled the top grid spaces but a terrific performance from Steve Boultbee Brooks who put his DB3S up in 8th, surely our most improved driver this year. Andy Shepherd and Spike Milligan were further down than usual, and it was good to see the Kennedy’s Lancia Aurelia setting a strong mid-field place. Whizzo & Wilkins held 19th place and Graham Love was out in the ‘always impressive’ Jaguar Mk7 in 23rd. The Mk 7 was a late substitute for Graham’s normal XK mount and whilst not your typical Inter-Marque since it would be a stretch to call this either a GT or sports car, its imposing and entertaining presence was not to be missed. John Arnold, hoping to be part of a team of 3 Jowett Jupiters next year. What a sight that would make! Once again FISCAR put out such a mix of 1950’s cars that is hard to match anywhere. The MGA’s of Simon Gurney & Andrew Moore have been regulars, John Arnold in the rare but sole Jowett on this occasion, and Rob Cobden’s Fairthorpe Electron rounding off a terrific grid. Mention should be made Peter Campbell’s unique Bristol engine Wingfield, a car not raced in anger for nearly 30 years and one of 3 Chairman’s class cars in the race. 29 made it to the race, we lost Richard Butterfield’s XK120 which broke a halfshaft (Jags seem to have this habit at CC), and the RGS Atalanta of Adams / Bamford who had done so well to get up to 7th on the grid. Brian Arculus half expected to be jumped by the Aston of Andy Sharp and the Healey 100 of Jonny Todd at the start and thus it proved! Off the line, Andrew Sharp launched the DB2 from 4th to take the lead, hotly pursued by Johnny Todd and Brian Arculus. Both Andy Shepherd and Spike Milligan took off well to pick up places on the opening lap. Mid-field the Sunbeam Alpine of Hampson / Bradfield got the jump on Jason Kennedy in the Lancia Aureilia which they were to hold off until the pit stops; Graham Love in the large Mk7 Jaguar used it’s surprising agility and it’s girth to pick up 5 places at the end of lap one, and was going places. Steve Boultbee-Brooks reinforcing the pace he had displayed in the Aston race charged up to 4th but the red mist caught him out on lap 3, heading into Quarry, taking in the wide angle view during a spin; Andy Shepherd was to make his great start stick, getting up to 3rd on lap 3 from 10th place on the grid and true to form he was playing to the crowd, really good stuff. Maybe he wasn’t entirely happy with the car in the practice session? The leading duo already into their epic battle as Brian Arculus signals his retirement. By lap 3 Brian Arculus was out from a strong 3rd position, rolling sadly but gently into retirement behind the banking, at Quarry with a failed drive shaft, apparently called a quarter shaft on the Elite! Promoted to spectator, Brian watched a brilliant race unfold between Thorne / Todd and Andrew Sharp and much dicing down the field which gave the crowd a thrilling spectacle. The proverbial fag packet difference was race long, and whilst Andrew drove both stints, Mike Thorne put in a cracking second stint in the Healey with a blindingly fast 1min 24s lap, some 1.8s better than anyone; impressive indeed! Cycle Wings. Frazer Nash leads Wingfield. Jon Abecassis dropped back at the start down to 11th from 6th, but clawed his way back to retain 6th through tight racing with the Wingfield Special, the Fraser Nash and the Elite of Robin Ellis, the latter two taking 4th and 5th. Whilst all this was going on the front runners, Andrew Sharp and Mike Thorne, were locked in battle royale. This would have been a great day to be at Quarry (it was - JT); you can see so much from there both before and after the challenging corner, and I wouldn’t be surprised if the bookies were there taking bets on who would come through first, on each and every lap, it was that tight. Put it this way, after 17 laps the gap was 0.073s, and that’s with two drivers in the Healey, just not at the same time! Apart from during the pitstop stage, when Sharp emerged with a small lead, and Andy Shepherd, then in 2nd, made Mike Thorne go the long way round at Quarry, the gap never exceeded 0.6s. It was superb racing! We’ll come to the last corner of the last lap later because I think the bookies had moved up there by then. The Lancia Autelia of Jason and Louise Kennedy looking as good and going as well as ever. In third, Andy Shepherd was strutting around waving to the girls, sort of Barry Sheene style, well on the track at least, but hugely entertaining as always. The Kennedys in the lovely Lancia Aurelia were going especially well, both in grid position and the race, tussling with the Sunbeam Alpine Le Mans of Hampson / Bradfield. A Formula 1 style pit stop strategy orchestrated by Louise kept Jason out one lap longer than the Sunbeam, Jason doing a hot lap into the pit stop and Louise came out ahead of the Alpine and sped off to hold the position to the chequered flag. Disappointed not to finish, Anthony Galliers-Pratt in the lovely Frazer Nash Targa Florio. In the background the Sunbeam Alpine Le Mans of Keith Hampson and Tristran Bradfield holds a slender advantage over the Kennedy's Lancia but this was to be reversed by the flag! Five non-finishers, including Spike Milligan who pitted the HWM with a broken exhaust and wasn't allowed out again, and Rob Cobden in the Fairthorpe which was over geared for the circuit compounded by the fact that it was mysteriously not pulling full revs in 3rd, but lots of smiling faces at the end of a beautiful day, which says it all really, or does it….. The last lap was a classic up front. Mike Thorne and Andrew Sharp holding their nerve and coming into Camp corner, a fast one with the chequered flag not far from the exit, all was hanging on this one corner, but hold on, there was another variable. Ian Mills in the XK 150 fixed head was minding his own business just about to finish the race, thinking about the list of cars his workshop hadn’t finished last week, and which one to prioritise on Monday morning, when suddenly he was flanked ‘Spitfire style’ by two hooligans trying to reach that flag first. One on either side, it could still have gone either way, but at least Ian would get into the photos, so back at work they would be impressed. How do you get by a Mk7 Jaguar? Well, with great difficulty and sometimes never, as in this case! 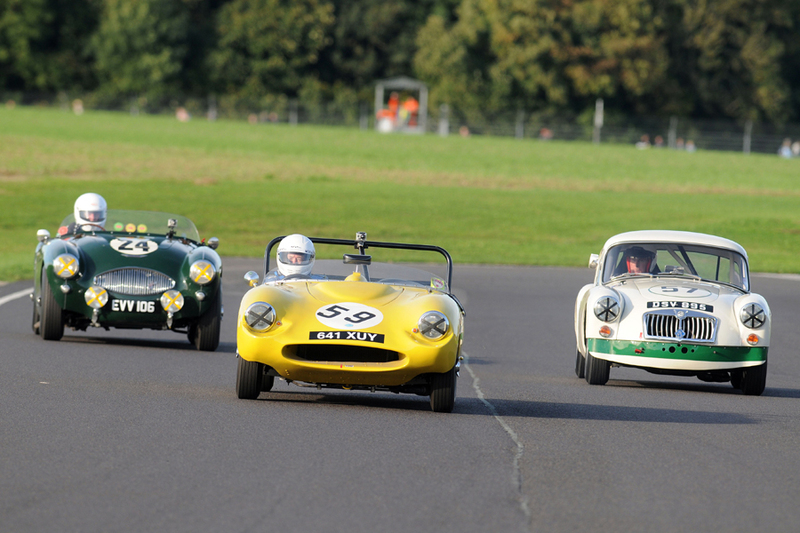 Graham and Alistair Love contrived to hold off David Large and Paul Woolmer in another epic race long dice to finish 15th with the Healey 100S just two tenths behind at the flag! Andrew Sharp somehow got it, but crikey those guys had built up a sweat and finished off the second FISCAR season in some considerable style, well done chaps, more next year please! Andrews defence of the lead for so many laps against such a formidable opponent was superb and he felt it was quite possibly his best win to date, and rather fitting in Aston Martin’s Centenary year. Looking at the lap analysis, a favourite of mine to find consistency, this showed that those with the most consistent usually do very well. By example, on this occasion the list included: Andrew Sharp; Thorne & Todd (individually); John Hilbery (a strong 9th); and Jason & Louise Kennedy. Unfortunately for Louise, she didn’t get many laps in because the race ended at 26 mins, not 30 mins, but I expect the organisers had the end of meeting curfew on their minds. Nevertheless, take a look at www.tsl-timing.com and look up race results, lap analysis and you will see what I mean. This great Steve Jones shot shows off the superb preparation of Woolmer Classic Engineering, our sponsor. The beautifully presented Austin Healey 100S of David Large, driven by David and Paul Woolmer to 16th. 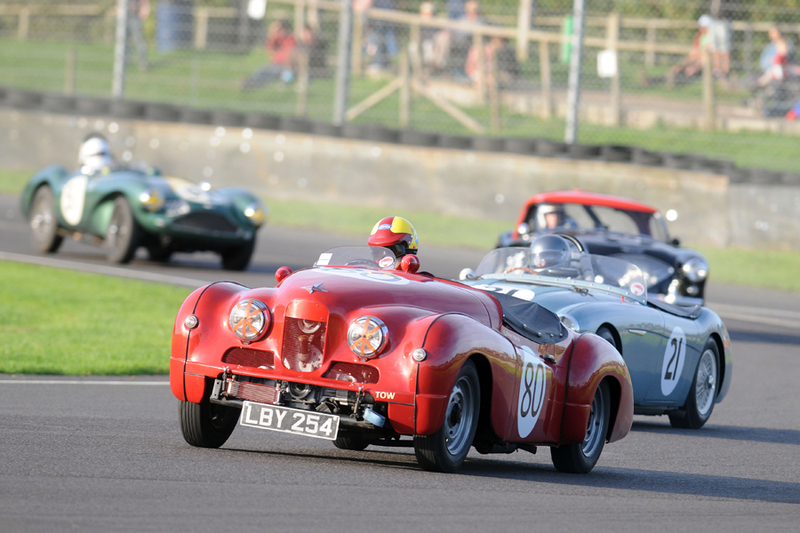 We were spoilt with two gorgeous DB3S cars; this is David Bennett on his way to 21st, 4 seconds ahead of Simon Moore's MGA, seen in the background. Nick Wilkins shared his XK120 with 'Whizzo' Williams to finish 20th. Check out other photos from this and previous races in our photo gallery. Tailpiece. Leaders ride out into the sunset!